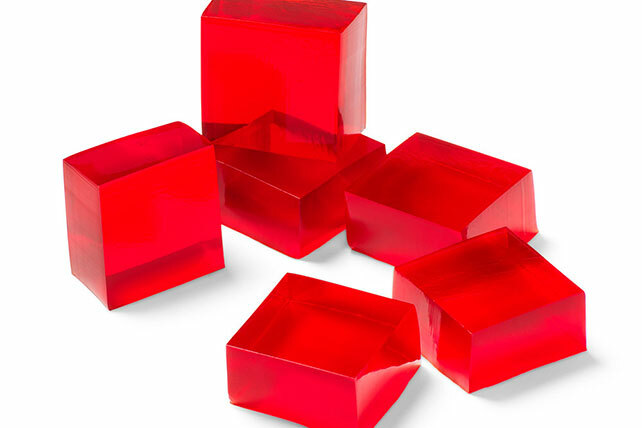 Cut raspberry flavor gelatin into squares for fun Finger Gelatin treats. Also known as Castle Bricks, kids can eat this Finger Gelatin with their hands! Combine first 2 ingredients in large bowl. Add boiling water; stir until completely dissolved. Refrigerate 1 hour or until firm before cutting into small squares. Instead of cutting the gelatin into squares, use cookie cutters to cut into assorted shapes. For children under 6 years of age, cut Finger Gelatin into small bite-size pieces. Children should always be seated and supervised while eating. For more information, visit www.KraftKidsSafe.com.